Most outdoor wearables evolve and improve gradually. This isn’t one of those products. 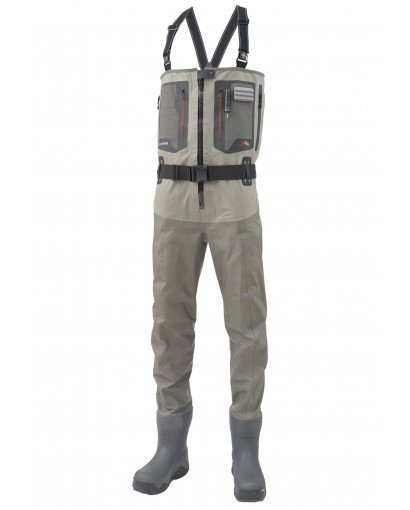 With the G4Z Bootfoot wader SIMMS has taken what is typically an entry-level product, powered it with the most feature-rich mix on the market, and catapulted it to top-tier status. The boots themselves offer impressive warmth and comfort, due to both integrated thermal materials and a roomy fit that significantly helps with blood circulation (anatomical last shape can be adjusted with removable footbeds for a secure and comfortable fit). They also ride higher than a regular wading shoe (think ski boot), resulting in improved overall stability. They are fully-lined and insulated with 7mm neoprene and grid fleece (rated to -40 F) for all-day warmth. The exterior consists of an overbuilt, tough shell that includes a triple-layer vulcanized rubber upper for durability and notable wading performance in extreme weather. Slip resistance comes via a die-cut RiverTread platform: a full-coverage plate for maximum rigidity and stud retention. The design also includes a 12mm felt outsole that accepts cleats and studs and a dual density EVA midsole for shock absorption. The top portion features a Pinnacle 3-layer GORE-TEX® PRO SHELL in the upper and 5-layer in the legs, synced with front and back leg seams to provide an articulated fit that maximizes both comfort and mobility. Other notable features: YKK waterproof center-front zipper for easy access/optimal ventilation, plush hand-warmer pockets, and ultra-grippy, rugged triple-layer vulcanized rubber for safer wading. The sole can be modified to your needs. Summary: the G4Z bootfoots are an entirely revamped – and vastly improved – product. Look for them if you require no-fail gear that will perform in extreme cold and unfavorable conditions.